We used to be turtle owners. And we loved our turtles very much. Which is why we initially created this site to help others care for their turtles. After we purchased our turtles, we didn’t really know much about them. We did know, through the help of our friendly neighborhood pet store, that we should keep them in a filtrated tank with water (we had red-eared sliders), but that was about it. To better care for them, we did online research and read books. We hope that our time spent will help someone else. We owned two female red-eared sliders. Their names were Einstein and Crawlie. Einstein and Crawlie were living the horrible turtle life of being kept in a 10 gallon tank with approximately 15 other baby turtles in a Florida pet store (which shall remain unnamed to avoid slander). My husband and I bought the turtles as a small wedding present to ourselves. They were our best companions until our dog, Snickers, came around. 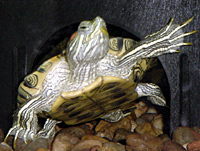 Our turtles had long since been taken away from that horrible pet store life and were living lushly in a 20-long tank. They were still fairly small, but we were sure they would soon outgrow the tank. So we made preparations to move them to a much larger 50-gallon tank. That is where they lived out the remainder of their lives. In case you are wondering why I’m talking about our turtles in past tense, it is that they both passed away. Einstein, passed away November 19th, 2001. Here sister, Crawlie, passed away almost a year later. A day doesn’t go by where we don’t miss them in our lives.